When people question the relevancy or the accessibility of classical music, they just show their ignorance (at least, this is my opinion, as a classical musician.) Classical music is deeply embedded in our culture – especially in our entertainment media. Have you heard of Hans Zimmer, Jerry Goldsmith, Dario Marianelli, or James Horner? If you answered “no,” I would suggest that you Google their names. My guess is that you probably have heard – and been inspired by – their music. Some worry that classical music will be overtaken by other industries – film, television, etc. I am not among them, as I am incredibly excited about the newest developments emanating from the classical music world. Karl Jenkins is a perfect example of someone who effortlessly transitions between commercialism and art. Perhaps most famously known for his Palladio, which was famously used in De Beers diamond television commercials, his Adiemus is truly a masterpiece on both an artistic and intellectual level. Combining musical influences across the world, Jenkins utilizes the voice as an instrument, as there are no lyrics. The absence of lyrics also allows the music to be equally enjoyed by all, despite differences in languages or cultural practices. Christopher Tin is another composer who is changing the classical music world. Well-known as a composer for the music of video games, he won two Grammy awards in 2011 for his Calling All Dawns. The Silk Road Project is another exciting movement, led by famed cellist Yo-Yo Ma (for those of you in the younger generation, he was one of the performers at Barack Obama’s 2008 inauguration.) The purpose of this project is to promote cross-cultural understanding by connecting musical traditions. Similar to the way that the Silk Road sparked innovation and ultimately brought the world together in new ways, this organization seeks to spark innovation in classical music and bring together all the world’s musicians. 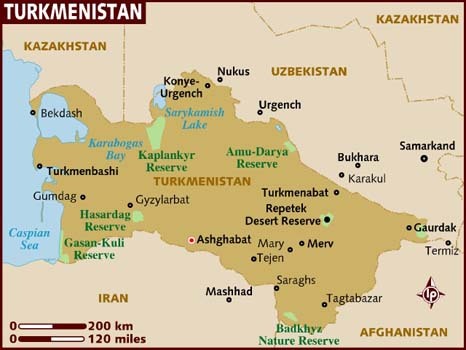 Nonetheless, the area of Turkmenistan was of strategic historical importance, as it was located on the Silk Road. From the stomping ground of Alexander the Great and Ghengis Khan to a pawn of the “Great Game” of power politics between Russia and Great Britain during the early 19th century, Turkmenistan and its history is deeply interconnected with the history of the Western World. 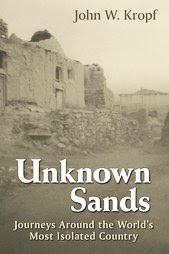 The author, John W. Kropf, moved to Turkmenistan in the late 1990s, after his wife had been assigned to the United States Embassy in the country’s capital of Ashgabat. He eventually began to work as the Country Director for the U.S. Agency for International Development (USAID.) They both left the country soon after 9/11 and before the War on Terror in Afghanistan began in earnest. Just found this. Thanks for the nice review of the book.